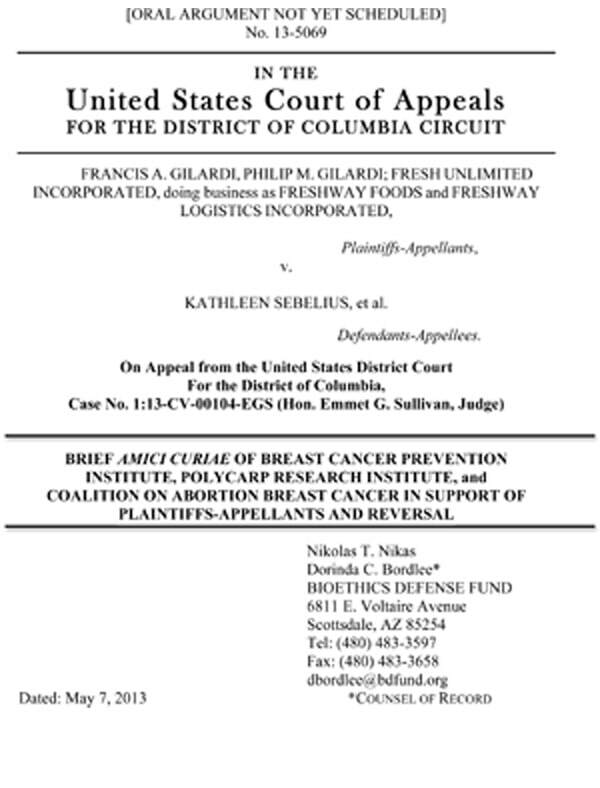 BCPI, with the Coalition on Abortion Breast Cancer and Polycarp Research Institute, wrote an Amicus Brief to support Francis Gilardi, et. al, vs. the U.S. Dept. of Health and Human Services challenging the Affordable Care Act’s mandate requiring employers to provide free coverage for contraceptives, abortion-inducing drugs and fertilizations, regardless of their rights to religious freedom. The U.S. Court of Appeals for the District of Columbia cited this brief in its decision handed down on November 1, 2013, which recognizes the World Health Organization’s (WHO) designation of certain contraceptive pills as Group 1 Carcinogenic to Humans.